Pure oats and pure oatmeal do not contain gluten. 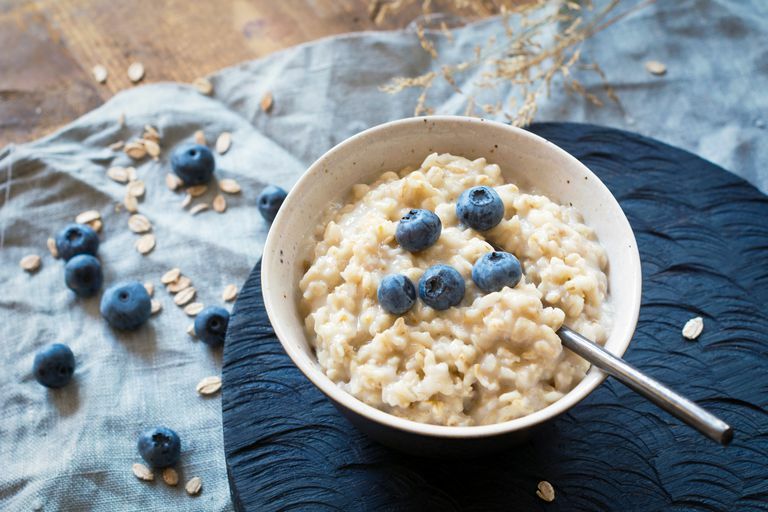 However, most oatmeal brands on the market today are not pure—they contain oats that have been cross-contaminated with a tiny amount of wheat, barley, and/or rye. Therefore, if you have celiac disease or non-celiac gluten sensitivity, you should stick with brands that are specifically labeled "gluten-free." In addition, you should know that some people with celiac or gluten sensitivity find they react to oats, as well. Therefore, you should be careful not to overdo that oatmeal until you know exactly how you'll react, and if you have questions about your reactions, discuss them with your doctor. Why Isn't All Oatmeal Gluten-Free? Since pure oats and pure oatmeal are gluten-free, you're probably wondering how gluten can get in. The problem is gluten cross-contamination that starts in farmers' fields and carries on through processing. Most farmers and food processors who grow and handle oats also grow and handle the gluten grains wheat, barley, and rye. Using the same equipment for both oats and gluten grains means that a tiny amount of gluten winds up in your oatmeal. Here's the statement from Quaker Oats regarding this problem: "Yes, oats are naturally gluten-free. However, during farming, transportation and storage, gluten-containing grains like wheat, rye, barley and spelt may be unintentionally introduced." It's possible to grow pure oats that are safe on the gluten-free diet, and companies selling certified gluten-free oatmeal are using oats that do not have any gluten cross-contamination. Those should be safe for the majority of people with celiac disease and non-celiac gluten sensitivity. However, some people will have reactions even with pure oats. Which Brands of Oatmeal Are Gluten-Free? Bob's Red Mill produces a large variety of gluten-free oatmeal, including easy-to-prepare oatmeal cups in four flavors, quick-cooking oats, rolled oats, and steel-cut oats. Bob's tests for gluten down to 20 parts per million. Make sure you purchase only gluten-free labeled oatmeal—Bob's also has oat products that are not gluten-free. GF Harvest is a celiac family-owned business in Wyoming. The company grows its own oats and performs extensive testing to make certain its fields remain uncontaminated, including testing the seeds it uses down to 3 parts per million. GF Harvest holds gluten-free certification along with organic and Kosher certifications. Products include organic gluten-free rolled oats and regular gluten-free rolled oats, which you can use to make gluten-free oatmeal. The company also offers easy-to-prepare oatmeal cups under the Canyon Oats brand. Glutenfreeda Foods offers eight different types of flavored instant gluten-free oatmeal. All contain flax meal in addition to gluten-free oatmeal. In addition, the company makes plain instant oatmeal and bulk oats. Glutenfreeda, which guarantees its oatmeal contains less than 5 parts per million of gluten, sells its products online and in some specialty stores. Montana Gluten-Free works directly with farmers to make certain the oats it sells are not cross-contaminated with gluten and certifies that its oats test to below 3 parts per million of gluten. The company offers cream of oats, "naked" oats, raw oatmeal, toasted oats, and oat-based baking supplies at the Montana Gluten-Free website. However, you should note that Quaker Oats doesn't source oats that have been grown away from gluten grains. Instead, the company buys regular oats (which generally are quite cross-contaminated with gluten grains) and then uses a controversial sorting technique that it says discards the gluten grains but keeps the oats. Quaker Oats tests its products to ensure they contain less than 20 parts per million of gluten (the minimum Food and Drug Administration standard). However, if you're particularly sensitive to trace gluten, you may want to consider a brand with more stringent testing standards. Note that other companies that sell gluten-free products also produce oatmeal that's not certified gluten-free—be very careful to double-check labels, and assume a product isn't safe unless it's specifically marked as gluten-free oatmeal. Can You Eat Oats or Oatmeal If You Have Celiac Disease? So can a celiac eat oats? In most cases, you can eat oats if you have celiac disease. But to make things even more complicated, a small percentage of people with celiac disease and non-celiac gluten sensitivity also react to avenin, the protein found in oats, which means they need to add oats to their list of prohibited grains. ﻿It's not clear how many people with celiac disease also react to oats—some estimates are in the range of 10 percent to 15 percent, but research is ongoing. In addition, there's evidence that some types of oats are more toxic than others to people with celiac disease. The Celiac Support Association says in its Guide to Oats that people with celiac disease should be cautious: "Most physicians advise people, those newly diagnosed with celiac disease, to wait until their health is restored before ingesting oats. Waiting one year or so to introduce uncontaminated oats in the diet is commonly suggested to increase a successful introduction. If symptoms return while eating oats...go oat-free for several weeks before reintroducing the oats." The Celiac Disease Foundation says, "Research indicates that pure, uncontaminated oats consumed in moderation (up to ½ cup dry rolled oats daily) are tolerated by most people with celiac disease. Look for oats specifically labeled gluten-free in all products containing oats, including granolas and granola bars." Beyond Celiac urges taking "a great deal of care" with this possible addition to your diet, and to discuss it with your physician. "There is no way to determine if you will react, so proceed with caution. Be sure to use oats that are 'pure, uncontaminated,' 'gluten-free,' or 'certified gluten-free.' Experts believe that up to 50g of dry gluten-free oats are considered safe. Check nutrition labels for portion size. People who develop any new symptoms after adding gluten-free oats to their diet should talk to their dietitian or doctor." Can Celiacs Eat All Oats? There's some evidence that certain types of oats may be less toxic to people with celiac disease than others. A Spanish study looked at how components of the immune system reacted to the different oat varieties in people with celiac. That study found some types of oats provoked less of an immune system response than others. And an Italian study used cell samples from people with celiac to see how those cells reacted to different oat varieties in test tubes. The study concluded that two oat varieties—Avena genziana and Avena potenza—didn't provoke major celiac-specific immune system reactions, at least in the test tube. But the researchers cautioned that both oat varieties did seem to cause some low-level immune system changes in the cell samples. Research on all of this is ongoing, but it's too early to single out particular oat varieties as safer or less safe for us to eat. If you have celiac or gluten sensitivity, the only way for you to determine if you react to oatmeal is to try some (start with just a couple of spoonfuls) in its pure, gluten-free form. There is some anecdotal evidence that people who are more sensitive to gluten also react more frequently to oats, but there's no research to prove it. Therefore, if you're a diagnosed celiac, you should consult your physician first and then proceed very cautiously when adding gluten-free oatmeal to your diet. If your celiac disease symptoms return, stop eating the gluten-free oatmeal immediately. Comino I et al. Diversity in oat potential immunogenicity: basis for the selection of oat varieties with no toxicity in coeliac disease. Gut. 2011 Jul;60(7):915-22. doi: 10.1136/gut.2010.225268. Epub 2011 Feb 12. Maglio M et al. Immunogenicity of two oat varieties, in relation to their safety for celiac patients. Scandanavian Journal of Gastroenterology. 2011 Oct;46(10):1194-205. doi: 10.3109/00365521.2011.603159. Epub 2011 Aug 15. North American Society for the Study of Celiac Disease Statement on Oats. April 2016.